In 1998 two 10 week old kittens were found by a client at the Marlborough Golf course. The kittens were adopted by the office manager of the clinic and brought home where they were so active they appeared to be bouncing off the walls like ping pong balls, hence their names. Pong, who was a bit obsessive compulsive and required much more attention, was later brought to the clinic to live where there was lots of activity to make him happy. Very friendly and gentle, Pong was also a fearless cat. Nothing fazed him other than being held, which he hated. 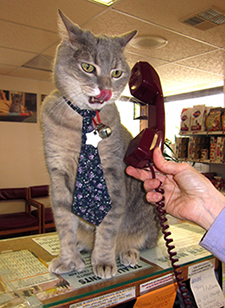 He was the cat often seen wearing a tie...he had a whole rack of them, for he believed in being well dressed at all times. He was an excellent receptionist especially with the computer and phones. He also enjoyed greeting pets and clients, attacking his favorite chair (the beat-up looking one in reception), and knocking things off of counter-tops. When he was not working, he spent his time with the other resident cats. In February of 2014, we lost sweet Pong when he finally succumbed to kidney disease. We enjoyed 16 years together and we miss him so very much. He will always be a part of this clinic in our memories, pictures and countless stories.